Soak water chestnut flour and 250ml water together, stir well and set aside for later use. In a pot, boil 500ml water with sugar together until sugar dissolved. Add dried osmanthus water and bring to a boil again. Turn off heat and cover pot with lid for 10 minutes. 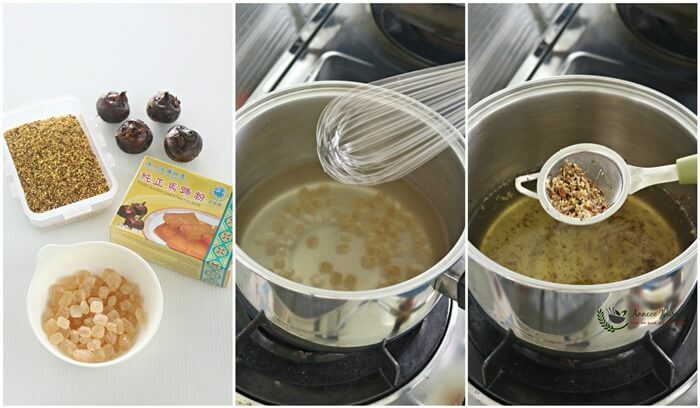 Remove some dried osmanthus flowers with a fine sieve. strain water chestnut liquid (step 1 ) through a fine sieve. 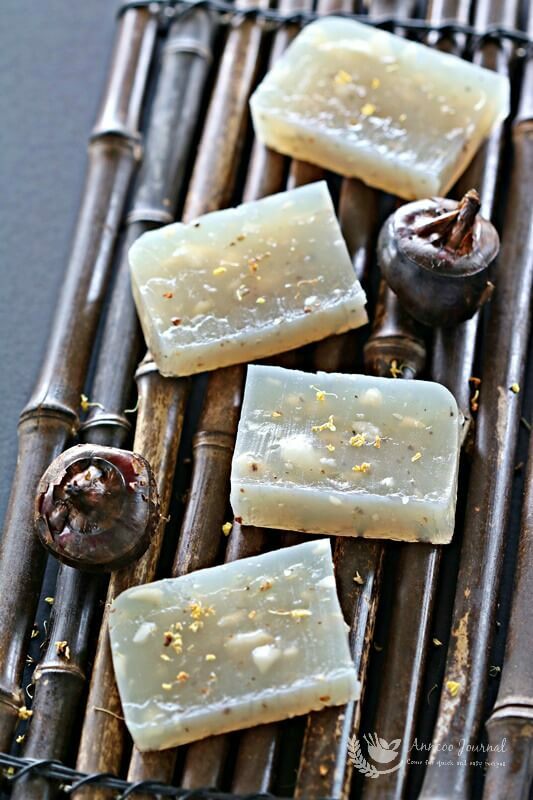 Bring osmanthus liquid to boil again, pour in the chopped water chestnut and stir well. Lower heat and pour water chestnut water slowly into the pot. 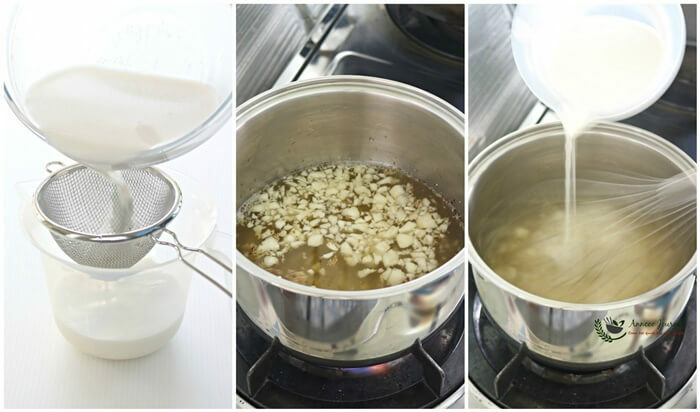 Stir the mixture as you pour until mixture thickened. Stirring the mixture constantly to prevent the batter sticks at the bottom. Grease pan (7 x 5 inches) with little oil and pour chestnut paste into it. Steam at high fire for about 25 minutes until cake turns translucent or test it with a skewer inserted comes out clean. 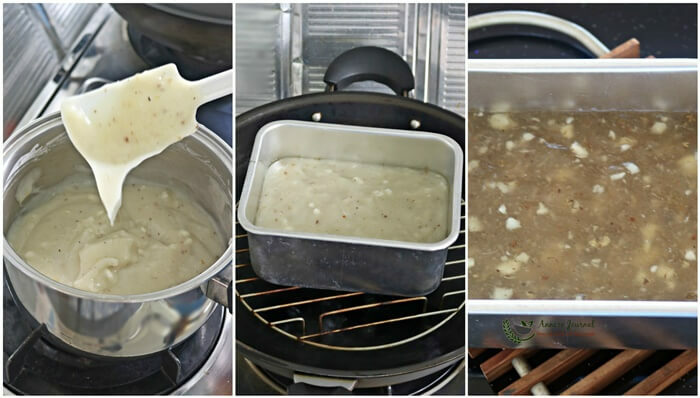 Leave water chestnut cake to cool before removing it from pan. 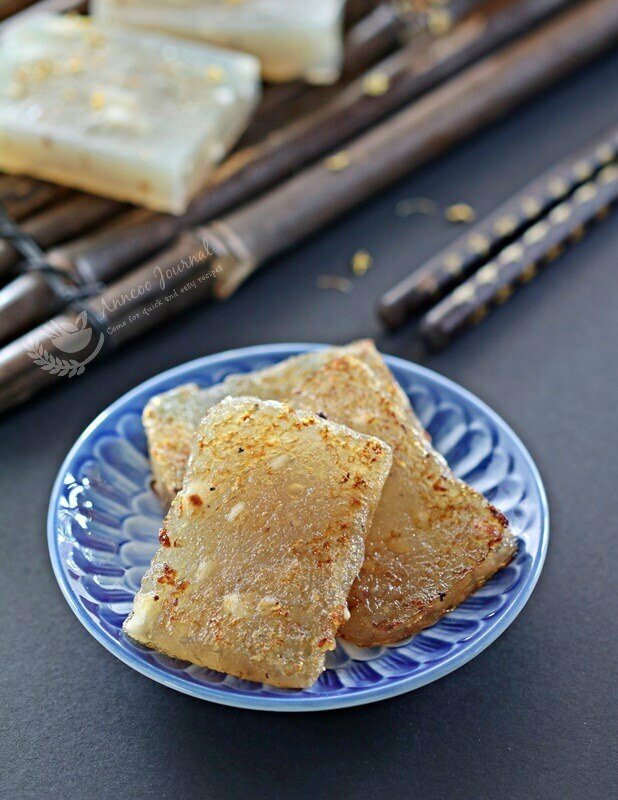 Slice the water chestnut cake with a wet knife, serve immediately or chilled. Alternately pan fry the cake till golden brown on both sides with cooking oil if preferred. 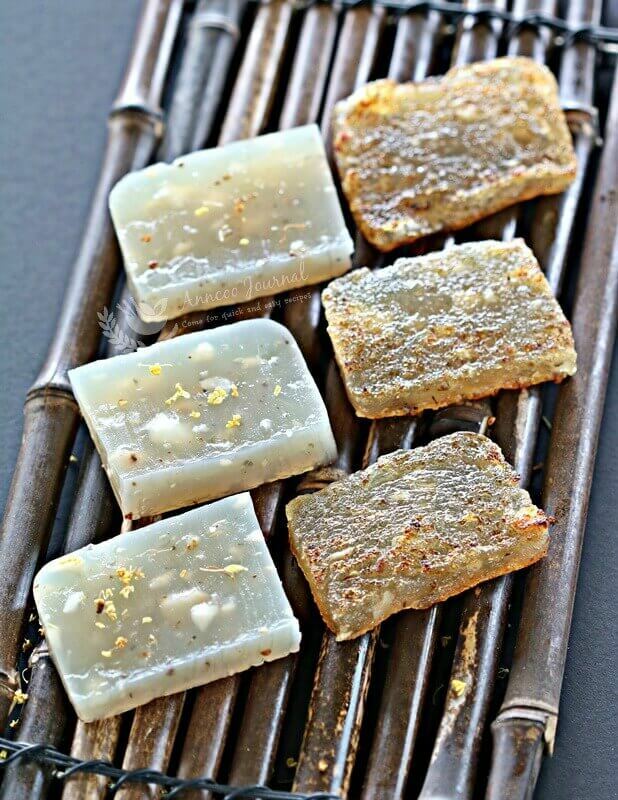 I've added some dried osmanthus flowers in the water chestnut cake to give a little floral scent of osmanthus. I chilled the water chestnut cake till next day before cutting. Hi, my water chestnut cake was very soft even though a skewer came out clean. How do I salvage the dessert? Hi Ade, you can store the chestnut cake in the chiller for a few hours before slicing and pan fry. Hi Ann! Love your blog!! Where can I get the Water chestnut flour pls?… thank you! Hi JTee, Thank you 🙂 If you’re from Singapore, you can can the water chestnut flour from Sheng Siong, Ang Moh and Kwong Cheong Thye. I love this treat…the slightly chewy and the crunchy water chestnuts…so good…I have never made this, but often order when at dim sum. Ann, I have never seen these water chestnut cake before. They look like jelly. I will like it – sticky and chewy and not too sweet. Used to be one of my must orders in dimsum restaurants! Yours looks so much better!